Life and MMA rumors come at you fast. For a solid two hours Jon Jones and Stipe Miocic was the fight to make. Then it wasn’t and the UFC news cycle continues to churn. Kind of like a rumor mill. A byproduct of what is now the ESPN era in UFC history, is that fighters have even less power. The UFC is now in position where it does not have to take risks due to a very large ESPN shaped safety net. Wild times ahead for our great sport. Happy last day of March 2019. It was good month. 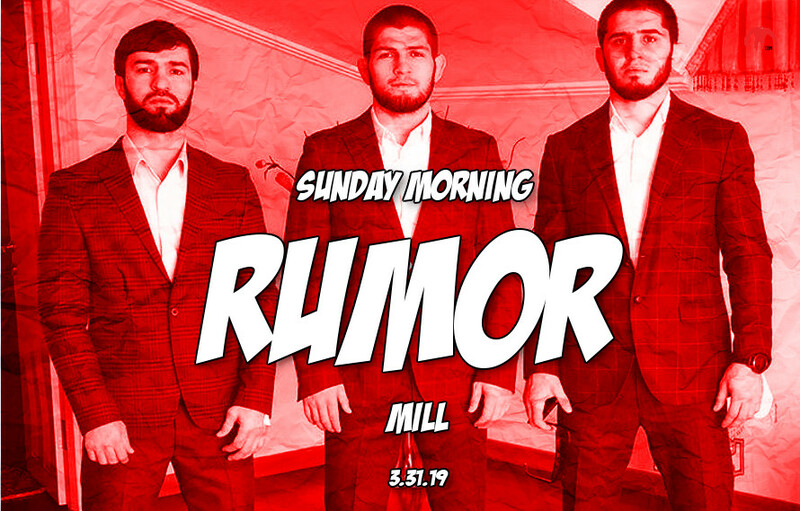 Spend the 31st enjoying some quality time with your Sunday Morning Rumor Mill. Huge if true, but it looks the UFC now has a date in mind for Khabib Nurmagomedov’s return. Rumor is Khabib may return to the cage earlier than expected. This also may be why fighters will begin to actively call out Khabib more. Rumors are the UFC already knew about Conor McGregor’s ploy before it went to Twitter. The move to seek more money reportedly did not catch the UFC off guard. Stipe Miocic vs. Bones Jones was the fight to make until it wasn’t. Rumor is the UFC and Team Jones still may take a fight at heavyweight in 2019. Only one week away from Ronda Rousey in the main event of WrestleMania, rumors are WWE may not be done tinkering with the match. Rousey is safe but the main event still add or subtract the humber people in the match from two, three or four.